Silhouette Portrait 2 Review - Is it Worth the Upgrade? Silhouette Portrait 2 Review – Is it Worth the Upgrade? The Silhouette Portrait 2 was released mid-November last year. Essentially it is the same great machine that we are used to seeing in the Portrait, but it comes with two main upgrades: the AutoBlade and deep-cut blade compatibility! 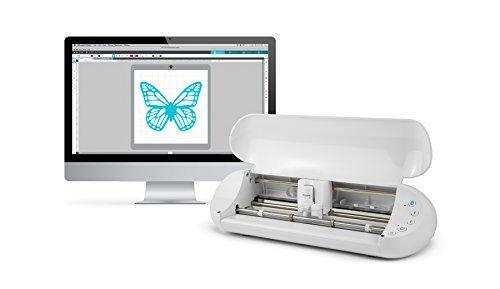 The new Silhouette Portrait 2’s new features bring it up to date and more in line with the very popular Cameo 3 Vinyl Cutter. The main difference is that the Portrait 2 is a smaller and more portable, and as a result, it can only cut material up to 8″ in width. For a lot of home crafters, this cutting space is more than enough, and it comes at a much more affordable price tag in comparison to the Cameo 3. But let’s get into the details as I share my favorite and not so favorite features with you in our Silhouette Portrait 2 review. We love the nifty upgrades on the Portrait 2. Essentially the Portrait 2 is aimed at beginner craft cutters. It is a compact, light machine that comes at a truly brilliant price tag. If you are happy with the 8″ cutting width that the Portrait 2 offers, you might be better off purchasing this machine in comparison to its more expensive competitor – the Cameo 3. Love that the upgrade includes an AutoBlade. The machine also has Bluetooth compatibility, PixScan compatibility and a nice 2mm clearance (when you purchase the additional blade). It can handle 100+ materials which is brilliant. It is light and portable and comes at a great price. The cutting force is on the weaker side at 210 grams. You are also pretty limited with the 8″ width cutting size. The software requires a bit of a learning expedition. Find below our personal opinions about the new Silhouette Portrait 2, but before you do, why not watch the short Silhouette Portrait 2 Overview video to see how the machine operates. The Silhouette Portrait 2 might look very similar to the first Portrait, but it also sports a few brand new nifty features. 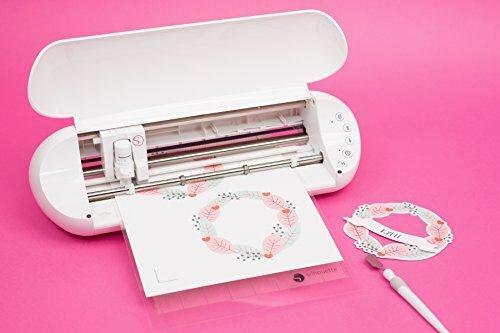 Ultimately the Portrait 2 is still focused on beginners crafters, and as such you will find that it might not be as good as the Cameo 3, but it does come at a lower and more affordable price tag for those who want to get into the die cutting and vinyl cutting craft. So what exactly do you get for this lovely price tag? Here is a list of the items you will find in your box! What can Silhouette Portrait 2 Cut? This new Silhouette Portrait 2 is a great machine for those who wish to work with a wide range of materials. It has the ability to cut over 100+ materials; from thin vinyl to thick leather, metal & foam. With the additional purchase of the Deep Cut Blade, the machine can handle any material that is up to 2mm in thickness. The cutting force is at 210 grams, which so it might not be the best machine if you wish to work with a material such as balsawood. The maximum cutting size of the Silhouette Portrait 2 is 8″ x 10 feet. This is a great size for personal home crafting projects. 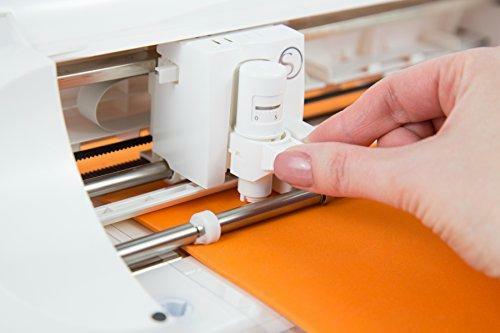 What we love about the machine is that it is compatible with the Silhouette Roll Feeder, which means that you can cut straight from a roll of vinyl without a mat to accommodate some larger project ideas. If you are after a larger cutting surface, we recommend you have a look at either the Cameo 3 Silhouette (12″ x 120″) or the US Cutter MH 871 MK2 (31″ x 96″). >>> Check out our die cutting machine comparison guide to see how the Portrait 2 stacks up against other machines. Below you will find a list of all the top features of the Silhouette Portrait 2. You will quickly notice that there have been some great upgrades made to the original Portrait and it is now just that step closer to its competitor the Cameo 3 Vinyl Cutter. 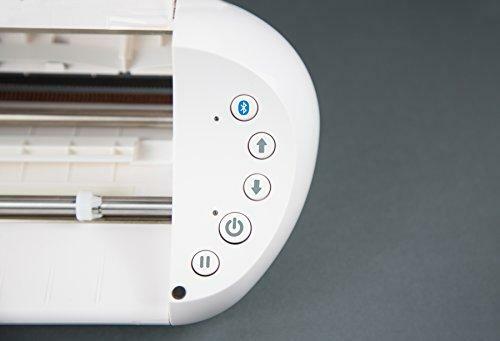 With advanced technology all around us these days, I don’t see how vinyl cutters can’t offer Bluetooth, so it great to see that this little machine can receive cuts to the Portrait from your choice of laptop, smartphone or tablet. No wires necessary! YES! We love autoblade functionality on a vinyl cutter and for us, it is pretty much essential. It makes life so much easier when the machine can do all the calculations and calibrations for you! The autoblade can automatically work out the best blade depths and pressure for the type of material that you are working with! So clever! If you wish to cutter thicker material, you will be stoked to know that the Portrait 2 can now cut up to 2mm thick material! You will need to use the Deep Cut Blade which you will need to purchase additional, but depending on the style of your craft, this might just be worth the added cost! The built-in scanner is great for those who love designing their own cuts. The optical scanner will allow you to make custom cutouts with the Print & Cut feature. Nifty! Just like the Cameo 3, the Silhouette Portrait 2 can use PixScan technology to scan and cut your own images. The PixScan allows you to photograph a design with your mobile device’s camera, import it into the software and then use the Portrait 2 to cut it out!! Are you loving these upgrades as much as we are?? Silhouette proudly states that the Silhouette 2 is their most compact DIY die cutting machine. 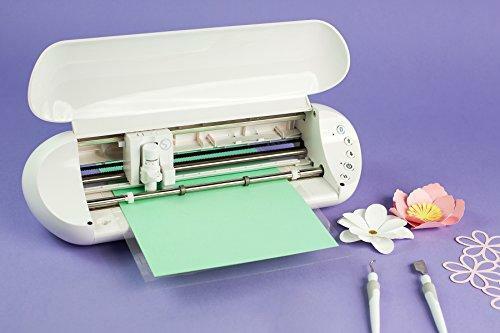 It has been designed as a beginner desktop vinyl cutting machine, but yet it is still powerful and will offer a lot of crafters all the functionality they could possibly want. The machine is small and lightweight (weighing under four pounds) so that you can take it to crafting events or move it around your house with ease. Below you will find a list of the features that we love about the Portrait 2, as well as the features that we are missing or that we wish were better! This machine’s remarkable ability to handle over 100 materials is definitely impressive! We love the Autoblade which automatically adjusts it’s pressure to the material being cut. Makes it so much easier to use and will save you time and hassles or adjusting settings. Crafters worker will larger scale projects will love the maximum cutting length of 10 feet (although the 8″ width might be restrictive). In comparison, the more expensive Cameo 3 can only go up to 24″. The perfect machine for those who wish to have a machine that they can easily port around. It weighs just under 6 pounds and is only 12″ wide. 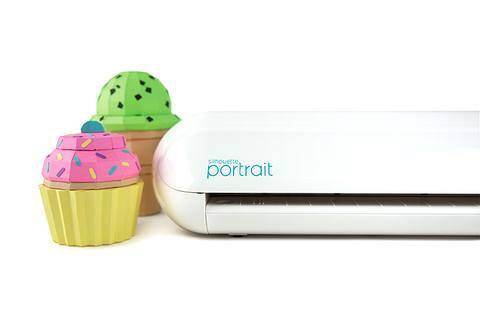 You can easily print your own images and then get this little machine to cut it out for you! It also has the ability to draw. The blade is replaced with a pen. If you wish to draw you will either need to purchase the Silhouette Pen Holder or invest in the Silhouette Sketch Pen Starter Kit which comes with 24 colored pens. The Silhouette Portrait 2 is a small and light machine, which means that it will naturally be limited in cutting size. Whilst it can cut up to 10 feet long, the width of 8″ will be pretty limiting for many crafters. The cutting force is 210 grams, which means it won’t be able to cut heavier items like balsawood. Using the deep cut blade with the machine will allow you to cut up to 2mm thick, but you will need to purchase this blade additionally. We honestly think that the Silhouette Portrait 2 is a great machine for beginners. Whilst it is a lovely upgrade from the original cutter, it still doesn’t match up to our pick as the best Silhouette Machine – the Cameo 3 cutting machine. Your budget is tight – this is a great machine for the money! Currently, the machine is listed at $199.99 on the Silhouette America website. You can typically pick up the machine for a cheaper price tag from Amazon. Click here to check current pricing for the Silhouette Portrait 2 on Amazon.